News audiences are watching more digital news video than ever before and newsrooms are investing in creating more video content. The challenge—as is the case with other digital ad revenue—is that big tech firms such as Google and Facebook are poised to pocket a large share of the digital video ad dollars because they are able to more effectively monetize video content. 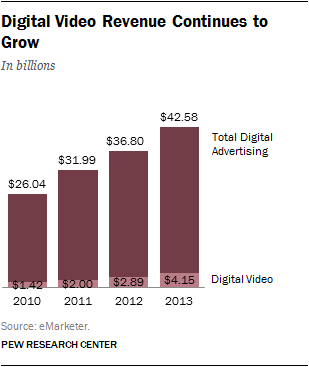 1The digital video advertising market is relatively small, but it is growing rapidly. According to eMarketer, digital video advertising in 2013 accounted for about 10% of the overall digital advertising market. But digital video ad revenue reached $4.15 billion in 2013, which represents a 44% increase from 2012 and almost a tripling of the revenue from 2010. YouTube is estimated to account for 20.5% of that that $4.15 billion in digital video advertising, and eMarketer estimates that its share will continue to grow, leaving fewer ad dollars for news organizations. 2Digital video consumption is growing and digital news video consumption is growing with it. Almost two-thirds of U.S. adults now watch videos online and more than half of those (36%) watch news videos. This is up from 40% of U.S. adults who watched or downloaded any kind of video in 2007 and 26% who watched or downloaded news videos. 3Younger adult Americans consume more digital video and digital news video than older ones. 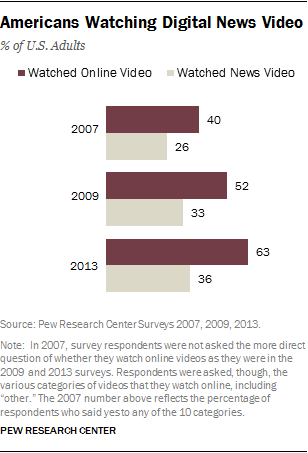 Nearly half of adults ages 18 to 29 watch online news video. That substantially outpaces that of older Americans. And it stands in contrast with surveys showing that when it comes to television news viewing habits, 18-29 year-olds tend to watch less than any other age group. 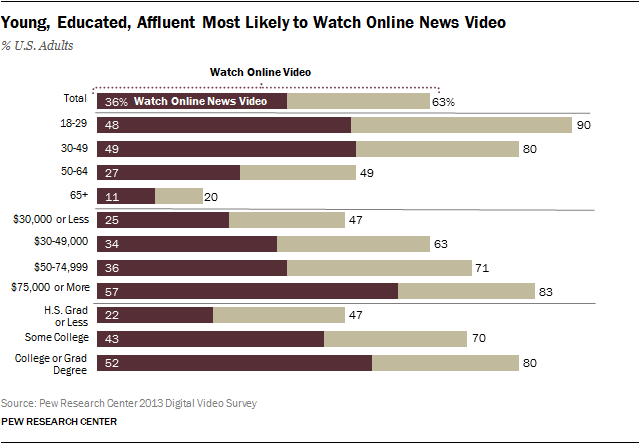 4More highly educated and wealthier Americans are more likely to watch digital news video. Slightly more than half of Americans with a bachelor or graduate degree from college (52%) watch news video online. This is moderately higher than the video news viewing of those who completed some college (43%) and more than double the rate of those with a high school degree or less (22%). In addition, Americans who earn more than $75,000 a year in household income are more likely watch news videos online. 5User-generated content is becoming part of the digital news video experience. According to Pew Research Center survey data 12% of social media users have posted their own videos of news events to social networking sites. In addition, 11% of online news consumers have submitted their own content—including videos, photos, articles or opinion pieces—to news organizations or blogs. One example of a news organization trying integrate this consumer content was NBC’s 2013 purchase of Stringwire, a company that helps consumers shoot live video and send it directly to NBC news facilities.